Eighty years ago this month, the world saw Charlie Chaplin’s beloved Little Tramp character for the last time—and heard him for the first time. Modern Times was to be Chaplin’s last excursion as the penniless scamp with the funny walk, as well as his last “silent” film before fully giving in to the advent of sound. (Modern Times, like City Lights before it, did have synchronized music and sound effects, and even some talking by certain characters.) It was a watershed moment for Chaplin and his millions of fans. To celebrate the 80th anniversary, here are some behind-the-scenes details about this comic, poignant classic. 1. IT WAS PARTLY INSPIRED BY A CONVERSATION WITH GANDHI. Between 1931 and 1932, Charlie Chaplin spent 16 months touring Europe to promote his film City Lights, and it was an eye-opening experience. The Great Depression was in full swing, and even the world's top celebrities couldn't help but see its effects. While in London, Chaplin met Mahatma Gandhi (who'd never seen his movies but knew of his fame) and discussed the activist's avoidance of modern technology. Chaplin told Gandhi, "I grant that machinery with only the consideration of profit has thrown men out of work and created a great deal of misery, but to use it as a service to humanity ... should be a help and benefit to mankind." But as they discussed it, Chaplin came to realize it was the first part of his statement—machinery that only considers profits has created a great deal of misery—that mattered most. Gandhi had convinced him without even trying. 2. CHARLIE CHAPLIN EXPERIMENTED WITH MAKING IT A TRADITIONAL TALKIE. Having created the most famous fictional character in the world entirely through pantomime and title cards, Chaplin understandably resisted Hollywood's movement to talking pictures. (He also saw how the cumbersome recording equipment that talkies required got in the actors' way and made their movements stiff, which was a death sentence for slapstick comedy.) Still, he gave it the ol' college try, writing scenes of dialogue for his Little Tramp character and even filming some before deciding it wasn't going to work. The Little Tramp needed to speak a universal language. When we do finally hear his voice at the end of the film, it's to sing a song in gibberish. 3. THE FACTORY BOSS LOOKS LIKE HENRY FORD FOR A REASON. Chaplin had met Henry Ford and had seen his industry-changing assembly line process, which had an obvious influence on Modern Times. It's not a coincidence that Chaplin hired an actor (Allan Garcia, one of his regulars) who resembled Ford to play the dictatorial head of the Fordian factory. 4. THE SHOOT LASTED 324 DAYS. Filming began on October 11, 1934 and ended August 30, 1935. That doesn't even include pre- and post-production. Is that a lot for an 87-minute movie? Yes. Yes, it is. (The Revenant, which is twice as long and was shot mostly in inhospitable conditions, took about the same amount of time.) Chaplin was a notorious perfectionist, shooting every scene multiple times—which put a tremendous burden on the actors, yes, but keep in mind, he was one of them. 5. IT TOOK SEVEN DAYS JUST TO FILM THE FEEDING MACHINE SEQUENCE. 6. IT ORIGINALLY HAD A MUCH SADDER ENDING. Modern Times ends with Chaplin and the young lady walking off arm-in-arm into the sunset. But the original finale had the girl becoming a nun while Chaplin's character was recovering in the hospital, thus separating them forever. This version was filmed but discarded in favor of the more cheerful conclusion. 7. THE COMMUNISTS LIKED IT, WHICH MADE SOME AMERICANS UNEASY. Chaplin, like many people, had been a fan of Communism in the 1920s, and by the mid-1930s was a charter member of Hollywood's Anti-Fascist League, an anti-Nazi (but pro-Communist) organization. Modern Times, which showed the perils of unfettered capitalism and made workers into heroes, appealed to the Communist mindset, earning enthusiastic support from publications like New Masses and the Daily Worker. Chaplin had even shown parts of the unfinished film to a visiting delegation from the Soviet film industry. All of this, in turn, muted some American critics' reaction to it. How can you praise a movie whose ideology is approved by the Commies? Meanwhile, some Communists had their own problems with the movie, as it depicts an individual rising up against the system. 8. 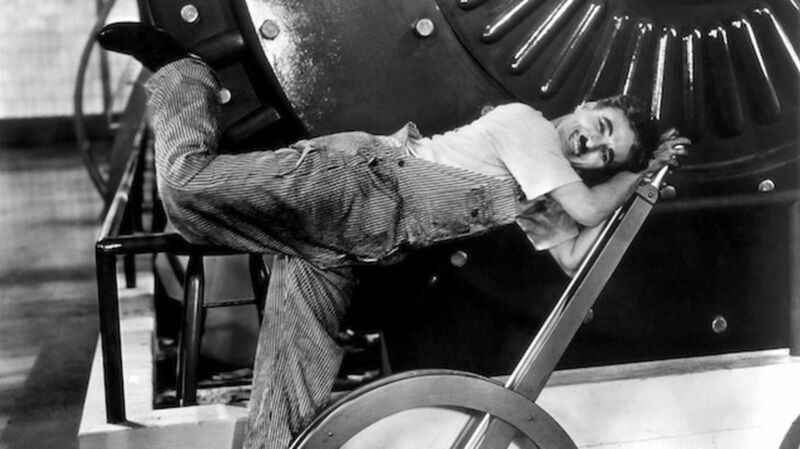 YES, CHAPLIN REALLY TRAVELED THROUGH THE COGS OF A MACHINE. One of the film's most famous images is of our hero going through a giant machine like film through a projector. The machine was made of rubber and wood rather than steel, but it was still uncomfortable enough that Chaplin only wanted to do it once. (Considering how much he normally loved doing multiple takes, it must have been really uncomfortable.) To show the character going backward again, Chaplin simply played the film backward. 9. THE MINISTER WAS CHAPLIN'S PERSONAL DOCTOR. Cecil Reynolds appears briefly in the film as the minister whose wife has digestive issues. Reynolds was a medical doctor and Chaplin's personal physician. This wasn't his first experience in filmmaking, though. He'd also been a medical consultant on Frankenstein and had a minor on-screen role. 10. CHAPLIN WAS SUED OVER IT. Modern Times has a few elements (notably the assembly line sequence) that are similar to À nous la liberté (Liberty for Us), a 1931 French film by René Clair. Clair himself was honored that a filmmaker who'd inspired him so much would be inspired by him, and he was deeply embarrassed when Tobis, the German company that owned the rights to À nous la liberté, sued Chaplin for plagiarism. Chaplin said he'd never seen Clair's film, and the suit went nowhere. After World War II (and some believe in retaliation for Chaplin's anti-Nazi film The Great Dictator), Tobis sued again. Eager to see it over and done with, Chaplin settled out of court.